Eukanuba Adult Large Breed Weight Control Formula Dog Food is a complete and balanced diet for large breed adult dogs (1 year and older weighing more than 50 lbs.) requiring nutritional weight management. 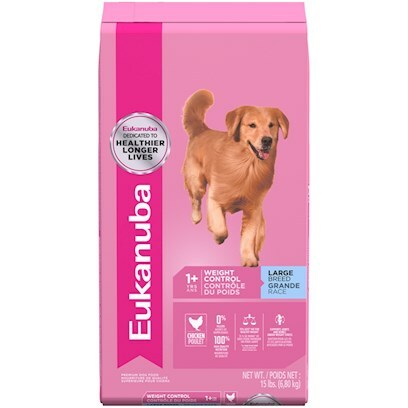 Eukanuba Adult Large Breed Weight Control Formula Dog Food has 31% less fat than Eukanuba Large Breed Adult Formula, to help maintain a healhty weight. Chicken protein is a key ingredient to build and maintain lean muscle mass for top body condition. Eukanuba Adult Large Breed Weight Control Formula Dog Food is a scientifically advanced formula to provide peak nutritional performance. High quality ingredients offer healthy benefits: DentaDenfense - 3D DentaDefense is proven to reduce tartar build-up Optimal Digestion - Fiber from a blend of natural beet pulp and prebiotic FOS promotes nutrient absorption and digestive health. Immune Health - Antioxidants help promote your dog's immune system and keep it strong. Strong, Lean Muscles - High quality animal-based proteins help build strong, lean muscles to target optimal body condition. Strong Bones - Contains calcium to promote strong bones. Optimal Weight - Excellent nutritional balance of fats, carbohydrates, vitamins and minerals and protein. Skin & Coat - Contains OmegaCoat, guaranteed optimal levels of Omega 6 and 3 fatty acids promote healthy skin and radiant coat. Corn Meal, Chicken By-Product Meal (Natural source of Chondroitin Sulfate and Glucosamine), Chicken, Ground Whole Grain Sorghum, Ground Whole Grain Barley, Dried Beet Pulp, Chicken Flavor, Fish Meal, Dried Egg Product, Potassium Chloride, Calcium Carbonate, Salt, Flax Meal, Sodium Hexametaphosphate, Fish Oil (preserved with mixed Tocopherols, a source of Vitamin E), Chicken Fat (preserved with mixed Tocopherols, a source of Vitamin E), Fructooligosaccharides, Minerals (Ferrous Sulfate, Zinc Oxide, Manganese Sulfate, Copper Sulfate, Manganous Oxide, Potassium Iodide, Cobalt Carbonate), Brewers Dried Yeast, Choline Chloride, DL-Methionine, Vitamins (Ascorbic Acid, Calcium Pantothenate, Biotin, Thiamine Mononitrate (source of vitamin B1), Vitamin B12 Supplement, Niacin, Riboflavin Supplement (source of vitamin B2), Pyridoxine Hydrochloride (source of vitamin B6), Inositol, Vitamin D3 Supplement, Folic Acid), Vitamin E Supplement, Vitamin A Acetate, L-Carnitine, Beta-Carotene, Citric Acid, Rosemary Extract. Feed this food to: Large Breed Dogs (51 - 90 lbs.) - 1 year & older that are overweight or have lower activity levels; Giant Breed Dogs (over 90 lbs.) - 2 years & older that are overweight or have lower activity levels. For dogs that are obese, we recommend Eukanuba Weight Loss. Because Eukanuba Large Breed Adult Weight Control is complete and balanced for maintenance, you do not need to add vitamin or mineral supplements.